The BBC has is launching a new version of their popular iPlayer service, which connects users to the BBC’s audio (radio) and video (TV) programs. The updated player, set to launch into beta by month-end, will offer new social features including integration with Facebook, Twitter and Windows Live Messenger. Users will be able to link their BBC account to the above social services. They can then tweet or share on Facebook what they’re watching. 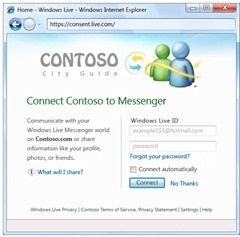 Windows Live Messenger users will be able to sync their viewing with their IM friends in order to watch and chat about a show together in real-time. According to the press release, this chat integration is an experimental feature – if it turns out to be successful, they’ll integrate more messaging services in the future.